Comtrend, a leading global provider of advanced networking solutions, has been named a bronze winner for their PowerGrid series in the prestigious Best in Biz Awards 2014. 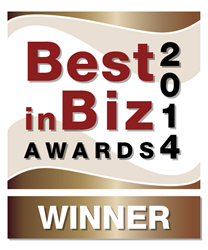 Best in Biz Awards is the only independent business awards program judged by members of the press and industry analysts. Comtrend’s award-winning family of powerline adapter solutions effortlessly connect your network without using over-saturated wireless technology. Simply plugging an adapter into a power outlet creates a secured, wired network through the home or office. This product line includes options such as wireless, Power over Ethernet, and G.hn technologies. The most recent addition, the PG-9172 G.hn Powerline Adapter, brings an ultra-fast Gigabit PHY rate to your device and is designed specifically to deliver seamless video streaming. G.hn is a next generation powerline solution for minimizing interference and works well in high-density environments, an improvement on current powerline technology. Senior Director of Business Development at Comtrend, Bradley Joe, stated, “We are all very excited about receiving this award. Our most recent G.hn Powerline Adapter is a new standards-based product and we believe that G.hn is a promising home networking technology that can make home/office networking quite simple for customers. G.hn can allow customers to plug into their network through power lines, phone lines, and coaxial cables already located in their homes and business. Plug and play home networking with gigabit speeds is a winning combination for our customers today." Since 1990, Comtrend has become one of the leading global providers of advanced networking solutions. Comtrend designs, manufactures, and markets a wide range of networking equipment consisting of bonded A/VDSL2, as well as home and office networking technologies. Comtrend is committed to industry standards, interoperability and market-leading performance. The company has its North American headquarters in Irvine, California. For more information, including Comtrend’s full lineup of home networking solutions, please visit http://www.comtrend.com.